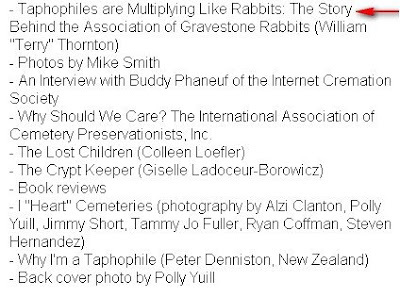 Epitaphs Magazine Fall/Winter 2008 was issued December 22 --- and the Graveyard Rabbits are discussed in the article Taphophiles are Multiplying Like Rabbits: The Story Behind the Association of Graveyard Rabbits. Editor Minda Powers-Douglas is a GYRabbit (of the Quad Cities). 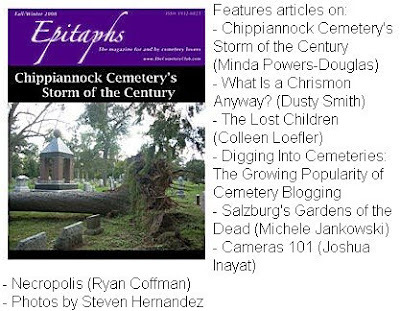 Epitaphs Magazine is available by single issues. A digital download of Fall/Winter 2008 can be bought at The Cemetery Club. Back issues are also available. My digital copy arrived this afternoon and I've had a wonderful time reading and looking --- the cover story article about storm damage in a cemetery is most interesting and gives me even more inspiration to begin a volunteer program of assisting local cemeteries with unexpected damage. The many photographs throughout Epitaphs Magazine makes it a pleasure for anyone interested in graveyards. Looking for a camera to photograph grave markers? Read about some of the features you don't need in a graveyard camera! 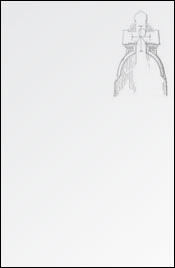 Here is a photo of the cover and a list of the articles in Epitaphs Magazine Fall/Winter 2008. The story behind the Association of Graveyard Rabbits is on page 17. Thanks Minda for this explanation of why taphophiles are multiplying like rabbits! That's great! Talk about good press! MEET "The Essex County Graveyard Rabbit"
MEET "The Central Florida Graveyard Rabbit"